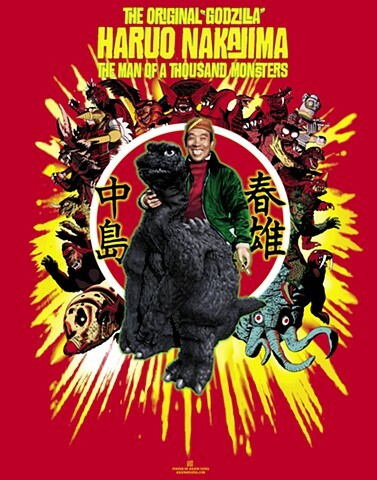 Mr Nakajima played Godzilla from the first movie in 1954 to the 12th in 1972, as well as all the monsters depicted here. This poster was commissioned by August Ragone for Mr Nakajima's appearance at Monsterpalooza in 2011. A special limited edition was created to be auctioned towards the Japan Earthquake Relief Fund. Prints of this are on the office walls of the Director & 2nd Unit Director of the 2014 GODZILLA, for which I did the crew t-shirts. I also play a fleeing extra in the movie.